Microsoft Vista for IT Security Professionals is designed for the professional system administrators who need to securely deploy Microsoft Vista in their networks. Readers will not only learn about the new security features of Vista, but they will learn how to safely integrate Vista with their existing wired and wireless network infrastructure and safely deploy with their existing applications and databases. 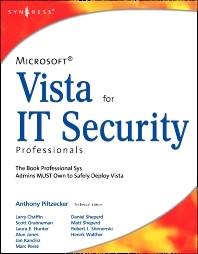 The book begins with a discussion of Microsoft's Trustworthy Computing Initiative and Vista's development cycle, which was like none other in Microsoft's history. Expert authors will separate the hype from the reality of Vista’s preparedness to withstand the 24 x 7 attacks it will face from malicious attackers as the world’s #1 desktop operating system. Microsoft vs. The World: What’s the Issue?